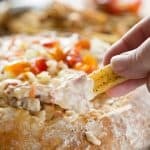 Inspired by a popular Pittsburgh Sandwich, this dip reimagines its signature ingredients – french fries and cole slaw – into one creamy, melty, mouth-watering game day appetizer! Place bread on baking sheet. Cut an oval on top of bread and remove bread center to make room for the dip. In a saucepan over medium heat, stir milk gradually into Pork Gravy Mix and whisk, stirring frequently. Cook on medium heat until gravy comes to a boil. Reduce heat to simmer. Stir in 1 cup of the cheese and mayonnaise. Cook 2 to 3 minutes or until cheese is melted. Stir in pastrami. Spoon dip into bread. Sprinkle with remaining 1/4 cup cheese. Bake 15 minutes or until cheese is melted and bread is warm. Top with coleslaw and tomatoes.